Note that the prep time does not include chilling. In a blender, puree the watermelon and ½ cup sugar until smooth. Pour into freezer pop molds leaving a 1½-inch space at the top. Drop 3 to 4 blueberries into each mold and insert a popsicle stick. Freeze for at least 3 hours. In a blender, puree ¼ cup sugar, lime juice, lime zest, cucumber, water and food coloring until smooth. Chill in the refrigerator. 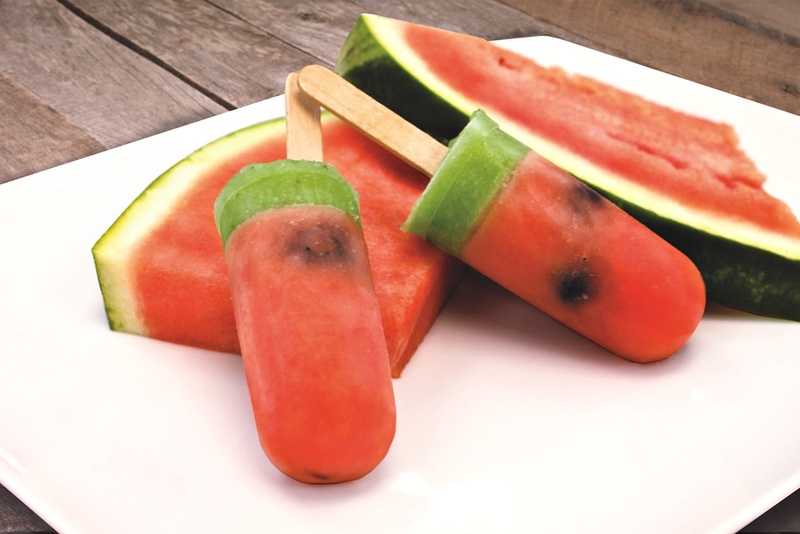 When the red parts of the watermelon pops are thoroughly frozen, pour the lime mixture onto the top of the molds. Freeze for at least 3 hours or until frozen. Green Food Coloring: You can use brands such as India Tree for a natural food coloring option. And remember that yellow and blue makes green! Another option is to blend in a small bit of spinach (make sure it is well purees (strain if needed), which offers color and nutrition without notable taste. For even more ease, spinach powder is available.